The exhibit in Haehn Museum features the Art Needlework Department of Saint Benedict’s Monastery. 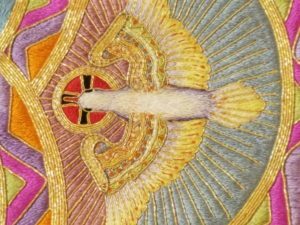 From its beginning in 1867, and until its closure in 1968, sisters in the department designed, hand embroidered, and sewed, at first, church accessories, but within a few years, church vestments. A total of 46 sisters worked in the department over its 101-year history, many of them for 20 or more years.